Every state in our gluttonously blessed union shines in its own way, and as always-hungry Americans, it's our solemn duty to find the single brightest source of that sparkle and take a big bite. It wasn't easy an easy task, but after polling our network of writers, friends, and distant family with strong opinions about hot tamales, we've compiled a list of the single food that you simply must eat in every state. Our criteria is admittedly loose. Some foods are the states' most famous exports, while others are icons that you won't see outside of their borders. For some dishes you want to go with the original that started it all, and other times a new-school innovator has taken things to a savory extreme that's just way more delicious. If you've got your own reasoning behind a different pick, let us know in the comments, as we always have room for seconds. 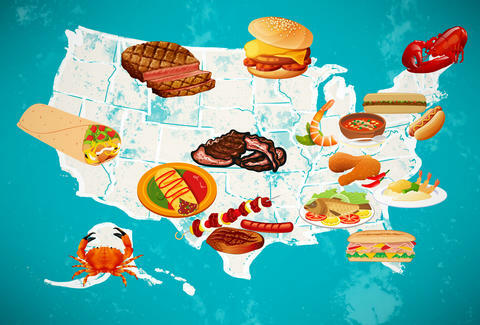 Here are the must-eat foods in every state (and DC). We debated everything from West Indies salad at Bayley's, to BBQ with white sauce at Big Bob Gibson’s, to fried green tomatoes, well, everywhere. Eventually, though, we landed on fried catfish and hushpuppies, a specialty up and down the state’s muddy rivers and an iconic Southern plate of golden fried food. Ezell’s Fish Camp now has multiple locations, but go to the original in tiny Butler for the true experience. Opened in the ‘30s, the family-owned restaurant (and, initially, family-run fishing camp) hauls the giant fish out of the nearby Tombigbee, fries up the filets, and serves them alongside dense hushpuppies. Be sure to get the slaw as another side. Sure, you can find some shady roadside stand peddling black bear jerky or a sausage made from one of Santa's reindeer, but the move here is to honor the fishermen who risk their lives trolling for Alaskan king crab, a crustacean that's perhaps the most dangerous thing to fish for in the entire ocean. 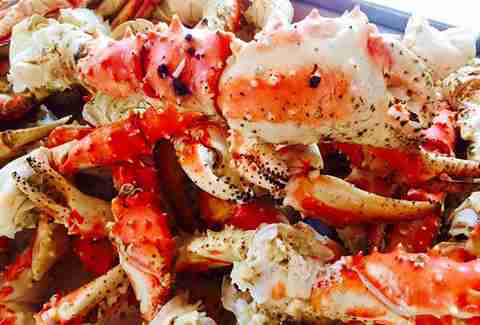 The place to go is Tracy's King Crab Shack, where the "Best Legs In Town" slogan isn't an exaggeration. Doused in butter, its crab claws are everything you'd want in a bite of crustacean, and Tracy's earns bonus points for a crab bisque that's worth the trip alone. We’ve long been fans of the spa town’s iconic restaurant and its fantastic spicy sauce. And the best vehicle to sop up that sauce is its fantastic chopped beef, which tastes of hickory and secrets and love. Oh, also: you need to get a tamale. Or a dozen tamales. And maybe a gallon of sauce to bring home. Ready for a rather obvious statement of fact? California is a giant place with lots of iconic foods. And while we do have a place in our hearts for the California burritos stuffed with fries and fish tacos of SoCal, we must go with our one true love: the Mission burrito. Yes, yes, it won all sorts of awards when Nate Silver used science and then people to cook up a huge burrito bracket, but we’ve been spouting off about the carnitas at La Taqueria for as long as Thrillist has been in SF, and its hard to argue with the perfection that is its super burrito, especially if you’re going to finish it off with those green/red salsas that are sitting on the table. 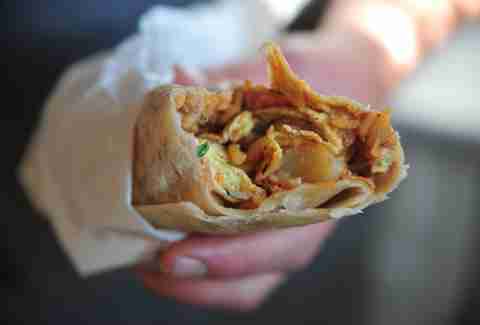 Yes, a breakfast burrito covered in green chile is perfect stoner food, but it was a breakfast staple in CO way, way before the other green stuff was legalized. There are seven ridiculously tasty spots in Denver to snag tortilla-wrapped heaven, but you can't go wrong at El Taco de Mexico, with a chorizo, rice, beans, and egg burrito smothered in green chile. And unlike some chains that shut the breakfast hose off at 11am, it doesn't have to be breakfast time for you to to order one -- it serves the morning meal all day long. In what may come as a surprise to most folks who've never been to the state, Connecticut's best food isn't, in fact, a single Saltine eaten at a boarding school. 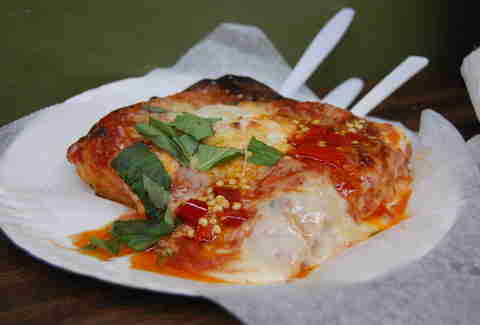 In fact, New Haven's got a pizza scene that rivals that of New York in the overall quality of its pies. Pepe's has been running this scene since the '20s, ferrying exquisitely charred crusts from coal-fired ovens into the clamoring mouths of a cultish following whose members rarely, if ever, overlap with close competitor Sally's. Pepe's "apizzas" are so old school, they come without cheese by default, so make sure you request some mozz or you'll have to wait in line for another hour to get seconds. Other than Dogfish Head and the beach, people often don't know much about what happens in The First State. Scrapple happens there. More scrapple is made in Bridgeville than anywhere in the world. As for what the hell scrapple is... it's a secret! OK, fine. It's essentially the parts of the pig no one wants to eat. But it's tradition in the DE/PA area, and people there eat it at brunch as part of a balanced breakfast. Chelsea Tavern in Wilmington offers it two ways -- as a side, or as scrapple hash, where it's mixed up with home fries, spicy ketchup, and an egg. Just because Tampa invented the Cuban sandwich doesn't mean its crazy contraption with salami is the best. No, the honor for best Cuban sandwich -- and food item -- in the state goes to a Cuban made in Dade. At this tiny cafeteria wedged in between artsy Wynwood and high-rising Midtown, you'll get ham, roast pork, Swiss, mustard, and mayo on fresh-baked and pressed Cuban bread. And while there's always debate about the best Cuban sandwich in Miami, this is the best one you'll find. Other than Outkast, Georgia's greatest export to the rest of the country is undoubtedly the chicken biscuit. Combining two great sources of Southern pride into one flaky, battery protein hand grenade isn't rocket science, but it does explode taste buds unlike any other Southern staple. 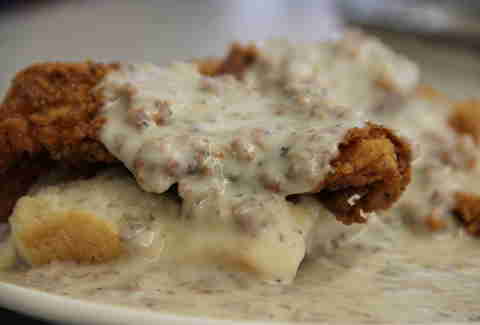 If we were judging biscuits alone, Silver Skillet might get the nod (we're suckers for grandmothers' recipes), but the total package is at Home Grown, whose massive buttermilk-brined chicken breasts sprawl onto a bed of biscuit, then get drowned in sausage gravy that tastes just as good as it looks. With respect to laulau, poke, loco moco, Spam musubi, and plate lunches everywhere, the most delicious of all the famously iconic Hawaiian foods has to be its take on the Portuguese donut known as the malasada. And no one in Hawaii has made them longer and better than Leonard’s, especially if you opt for the traditional sugar-covered, or feel like getting a little chubbier with the custard-style. When we named Boise Fry Company’s original bison burger best in the state, we kind of knew the answer to Idaho’s best fries as well. And while the state does amazing things with other foodstuffs, the humble fry is forever associated with Idaho. Yes, still get that bison burger, but go in with the expectation that it might actually take a backseat to the spuds, which you can customize by potato type (sweet, purple, gold) and cut (regular, shoestring, homestyle, balls, and waffle are among the shapes), then pick seasonings and sauces that range from blueberry ketchup to roasted garlic. Basically, the options are limitless. Suddenly, the potato doesn’t seem so humble. Deep dish and dogs are generally the first foodstuffs sought by tourists. Downstate, you'll find heart-stopping horseshoes and some celebrated BBQ. 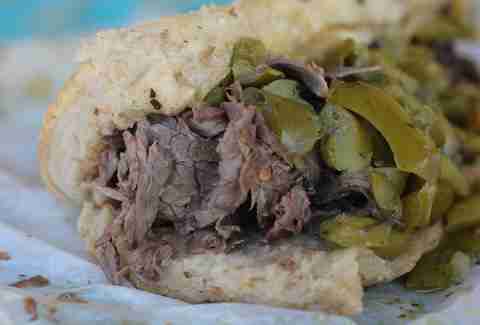 But if you want to start a real argument, especially in the Chicago area, start talking about Italian beef, sort of like an Italian riff on a French dip to the uninitiated, and much, much more than that to those who get it. Be warned: you have decisions to make. Should you get it dipped (the whole damn sandwich dunked in the rich, spice-laden pan gravy), wet (an extra ladle full poured over the ribbons of beefy goodness held together by a soft roll), or dry (what's wrong with you?). Then it's onto the peppers. Will it be sweet (grilled green and/or red bells) or hot (giardiniera, a glorious relish of spicy pickled vegetables that varies from place to place)? It's a lot to figure out, so don't sweat where to get one. Just go to Johnnie's. The shrimp cocktail at St. Elmo's is a memorable experience, and some Hoosiers are certain to be angry about Iowa getting the nod on pork tenderloin sandwiches (and to be sure, they have many a fine rendition as well), but there's something sweetly soul-satisfying about a sugar cream pie (does anyone dislike ANY of those words?). Wick's has built an empire on these custardy delights (it'll ship all over), but like so many things, they're another experience altogether tasted fresh from the source. Trek out to the small town of Winchester (about 90 minutes west of Indianapolis), order a slice, and enjoy forkful after forkful as three of the most perfect English words dance through your head. Sugar. Cream. Pie. Hog farming is serious business in Iowa, and so are breaded pork tenderloin sandwiches, one of the meaty fruits (sure, why not) of said farming. You can't go wrong with the version at Breitbach's (now on its sixth generation of owners dating back to the 1850s), though you might be violating doctor's orders to restrict your pork intake. You'll find a hubcap-sized serving of tenderloin, pounded thin, battered, and impossibly juicy. 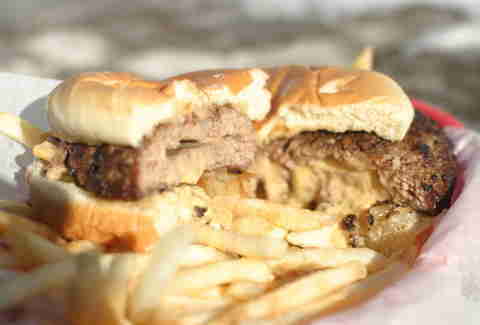 You'll also find a tiny burger-sized bun and smattering of fixin's that are completely dwarfed by the pork's presence. Do not be alarmed. Embrace the pork. It is your destiny. Yes, burnt ends are the Kansas City signature, and Joe's has some of the best around (on Monday, Wednesday, and Saturday, at least). And they also make a perfect brisket, which is just fine on its own. 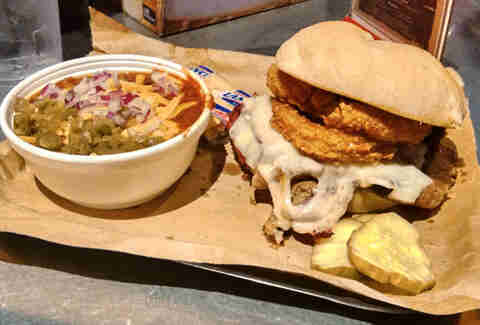 But the Z-Man somehow makes it even better, stacking onion rings, smoked provolone, and the signature meat on a kaiser roll. We keep going back to it when we think of KC BBQ. We don't know how to quit you, Z-Man. Sometimes, the original isn’t the best. Just look at Terminator 2. Or Gallagher II, for that matter. But when it comes to the Hot Brown -- Kentucky's legendary open-face turkey, bacon, and Mornay sauce masterpiece -- the original at the Brown Hotel remains the best. With respect to the Colonel and Billy Ray Cyrus, it’s the tastiest icon Kentucky has birthed. Even more than boudin sausage and po-boys, gumbo represents Louisiana’s entire attitude toward food: it’s a rich, deeply flavored stew that utilizes whatever’s bountiful in the season, shows off the state’s unique heritage, and is meant to draw in the family and neighbors for a shared meal. Dooky Chase's serves our favorite Creole gumbo, laden with andouille, veal, shrimp, and oysters, and thickened with a dash of filé. But if you can make it to NOLA on the week before Easter, you may be able to grab a bowl of its gumbo z’herbes, a rarely seen green gumbo made for Holy Thursday, and preserved in the culinary tradition of the region by Leah Chase, the restaurant’s matriarch. Our NY editor Andrew Zimmer spent the summer eating his way through lobster roll joints all around the East Coast, which is alarming in its own right, but also makes him a verifiable expert in the field, and through all his travels, he never encountered anyone more passionate about lobster than Steve Kingston, the owner of The Clam Shack. From him: “Steve only serves 'new' shell because the meat is sweeter and more tender, and he has his own lobstermen he uses to supply him so he knows exactly what he’s getting. He keeps them in seawater, instead of cold water -- because he sells so many so quickly he doesn’t have to worry about them eating each other -- then boils them in salt water, shucks them fresh, and cools them on ice. The actual roll isn’t a hot dog roll, it’s a tasty white bread round roll from a local bakery called Reilly’s, and the house choice for how to get it is with both Kate’s local Maine butter AND Ken’s extra heavy mayo. It’s so (swear word) delicious.” So… there. We'll happily line up for a Baltimore pit beef on a Kaiser roll any day of the week, but when in a port state, nothing tastes sweeter than the local catch. Faidley's seafood stall is the most popular destination at the iconic Lexington Market, where Nancy Faidley-Devine dishes out 6.5oz patties of lump crab bonded by a dream team of crushed Saltines, mayo, egg, Dijon, Worcestershire, and Tabasco. The golden results are so renowned that NASA commissioned the Faidleys to make an astronaut-friendly version of the recipe, but for those unable to travel to either Maryland or outer space, Faidley's does the kindness of shipping its crab cakes anywhere in the States. Though Mass doesn’t have the same claim to lobster rolls as Maine, its North Shore is allegedly where fried clams got their start, thanks to the abundance of clam beds around Ipswich and Essex. Woodman’s, which will turn 100 next year, is our favorite of all of the quality fried-clam joints around these parts (and there are many), thanks to a recipe it's kept basically intact for that entire century. It involves lard, deliciousness, and salty New England secrets. Oh, and it might not count, but you might as well get a couple of Nana Bessie’s clam cakes while you’re there. 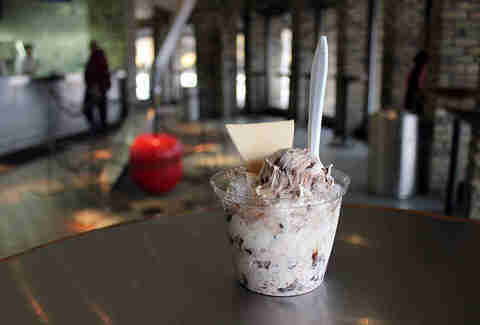 And some of Gifford’s ice cream. And some pants with an elastic waistband. While we can debate for days who makes the best coney among the hundreds of options in Michigan (even though the answer is Angelo’s in Flint), nothing short of a leg full of black fly bites is more pure Michigan than the pasty, a humble Cornish-style, hand-held pie stuffed traditionally with beef, potatoes, and love. And while there are myriad amazing spots throughout upper Michigan and the UP that go under the radar, the Mackinaw Pastie & Cookie Co. is the meeting ground between peninsulas, offering up a perfect take on Michigan’s truest comfort food. At the risk of sounding like a troll, we recommend it covered in gravy. But really, ketchup -- or plain -- is fine too. Philadelphia may have its cheesesteak, Chicago its hot dog, and New York its pizza, but Minneapolis was the birth place of the best signature dish of all: lutefisk, with its pungent lye flav... wait, no. It was the birthplace of this gloriously cheese-stuffed burger, supposedly invented at a place called Matt’s Bar some time in the late 1950s, when a customer requested a burger with cheese in the center, and Matt lovingly obliged. When he bit into it, the customer apparently exclaimed, “that's one jucy Lucy!”, apparently because vulgarity (specifically the phrase OMFG!) and the letter "I" hadn’t yet been invented. Thankfully, a brand-new kind of burger had been invented, and while there are now plenty of great spots to get one -- the Nook, the 5-8 Club (which also claims to have invented this thing), etc. -- the original is still the best. In the Delta, nothing rolls into the mouth, or off of the tongue, quite like a hot 'amale. The history of the corn-husked snack is well documented by the Southern Foodways Alliance, which has interviewed the best of the best (nobody pronounces that second "t"!). It'd be an impossible task to pick the most delicious... if it weren't for help from the judges of the Delta Hot Tamale Festival, who most recently crowned Scott's brisket tamale the best of the commercial category. The original proprietor, Elizabeth Scott, retired in 2001 (after 41 years in business), and can still be seen hanging around the tiny roadside stand, but these days it's her children and grandchildren who are rolling the shucks. Lucky for anyone who passes by, good taste still runs in the family. Rule-breaking pitmaster Mike “Smokey” Emerson might turn the heads of St. Louis bone-lickers who expect a pint of sauce on a a rack of spares, but they become believers once they've tasted his gospel: dry-rubbed baby backs bathed in apple and cherrywood smoke for 14 hours, then given a light glaze in tribute to the saucier versions you'll see at neighboring joints. It's our rib choice among the crowded field of pitmasters because he's not hiding behind sauce, but is enough of a gentlemen to offer three bottles on the table. The one caveat might be that this is the best thing to eat in the state before 7pm, because Pappy's is known to sell out of the nearly full ton of meat it cooks every day. You can get great beef and bison throughout Montana, but we’re pretty partial to the no-frills, perfectly grilled ribeye at this Logan spot, which balances rustic aesthetics with high-end meat that probably was roaming down the street earlier in the day. There’s nothing fancy here -- you're in Montana, so expect timber-clad walls and cowboy-hatted company -- just a perfect cut of beef, cooked exactly how you like it. In a state where a great steak can be had in even the dustiest saloons, it stands tall. 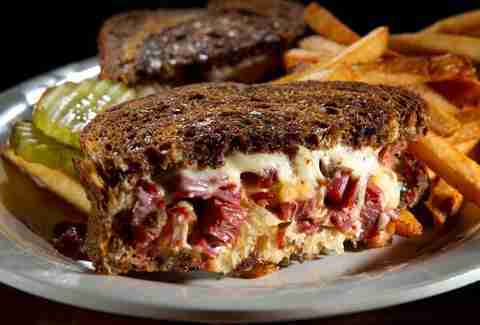 With respect to every effin’ New York deli owner, the combination of rye, sauerkraut, corned beef, and Thousand Island dressing hails from the Midwest’s least-conspicuous state. The Blackstone Hotel invented it, and the Crescent Moon -- also the state’s best beer bar -- has retained the original recipe. It’s the best of its kind, and though we’re also all about runzas, the Reuben is still king. We were tempted to go all-in with a buffet, but concluded that an all-you-can-eat situation is the food equivalent of asking a genie for unlimited wishes, which is clearly not allowed. Genie rules aside, the one dish that sums up Las Vegas more than anything else is the shrimp cocktail. For best in show, we're placing our bet at the Golden Gate Casino, which originated the dish in 1959 for a meager 99 cents. Inflation's increased the cost slightly, but admiration for its sundae dish full of cocktail sauce-drenched shrimp has remained the same. New Hampshire is a tough state to pick a signature food. It has all the elements of the other New England states, but it's just known for doing them the same way. And it’s not like we’re going to pick Burdick’s chocolate mice or Stonyfield yogurt. 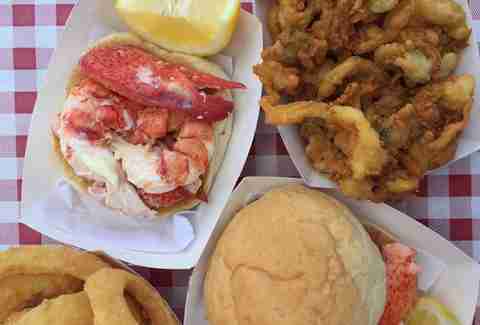 With that said, we’ve picked one of the best of the signature eats from an iconic NH beach spot to do the job. Markey’s has been around since 1971 on the Seacoast, and while it's got a lot of good traditional New England clam shack dishes, the fried lobster tail on the lobster plate stands out. Other places consider the lobster too precious a commodity to fry up, and that’s A BIG MISTAKE ON THEIR PART. These tails stay juicy on the inside and deliver a pretty damn good signature dish for The Granite State. No offense to those little chocolate rodents. 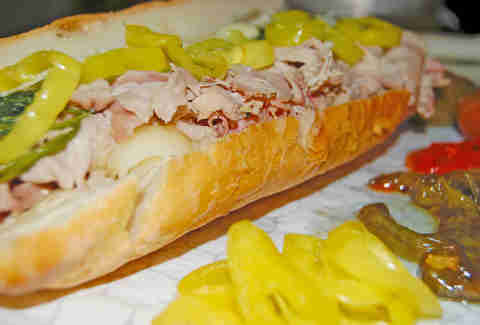 When Tony Bourdain stopped by Frank's, he went with an Italian sub, but anyone from Jersey can tell you that one of the things they miss most when they leave is pork roll, aka Taylor Ham, aka a cylindrical tube of not-quite-bologna that could challenge Folgers for the title of best thing about waking up. You can get them anywhere in the state, but our ex-pat source sang the praises of Frank's as the finest in the land, so very fine that she would have it driven across state lines. Hit it with a little SPK (salt/pepper/ketchup) and there's no better way to start a day in The Garden State. All due respect to the fantastic and widely praised green chile burger at Santa Fe Bite, but we think the greatest chile-based dish in this state happens to involve chicken enchiladas at Tune-Up Cafe. Also, isn’t the term “Christmas-style” just kind of the greatest of all shorthands? And isn’t it even better that it involves mixing red and green chile? There's perhaps nothing more authentically New York than a dollar slice or a dirty-water dog, but both of those are typically consumed in lessened states of judgement, followed by heightened sense of heartburn. For the single best thing to eat in a state blessed with every food imaginable, we skipped the dog and went with a slice, albeit a $5 one. Di Fara has been in business since 1964, and even the finest-dining restaurants can't make a claim to the level of auteurship that comes with the owner's hands touching every single pie. Hell, on our NYC pizza ranking he was called the city's equivalent of Jiro. Accordingly, that personal touch results in a lengthy wait time, but it's worth it for such a once-in-a-lifetime slice. If North Carolina had to choose a patron saint, it would have to be the humble hog. Dividing lines aside, Piedmont and Eastern can both agree that if you travel to The Tar Heel State, it'd be a sin not to put some pig in your mouth. People have spent lifetimes arguing on porches over Clyde Cooper's or Lexington BBQ or Red Bridges or just the first smokehouse you can find, but in terms of pure chopped-pork bliss, the must-eat bite is the freshly picked whole hog from Skylight Inn, with just the right amount of crispy skin mixed in, a fist's worth of slaw, and several generations' worth of history. Look, we could pretend to like knoephla dumplings and whatever lutefisk is, but North Dakota is the home where the buffalo roam, and sometimes the best thing you can get in a state with little culinary identity is a burger. And while we can’t deny the greatness of a no-frills burger with a side of wood paneling at Bismarck’s Wood House, we’re also suckers for the fancier version at Fargo’s HoDo. The lean, rare patty comes garnished with shallot jam and aged cheddar, but don’t let the frills fool you. The meat is front and center. Just like on the North Dakota quarter! Cleveland has its Polish Boy. Parma has its pierogies. The world has the slider. 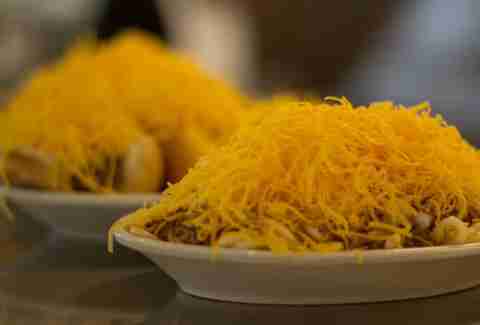 But Cincinnati’s famous chili is the true icon, and though Skyline claims the most fame, our beans are on Camp Washington. Logic dictates to get it 5 Ways -- chili, onions, cheese, beans, and spaghetti -- though we also recommend it on a hot dog. Or a burger. Or on fries. Or in a bowl. Really, get it however you want. You’re in a chili parlor, after all, not a Left Eye one. If there’s one thing Oklahoma is known for, it’s being home to Chuck Norris, Brad Pitt, AND Food Network star Ree Drummond, aka the Pioneer Woman. But if there’s another thing, it’s the onion burger. Essentially created during the Depression because onions were cheaper than meat, the onions cook in with the beef on the griddle and make everything taste fantastic. And the best place in the state to get said onion burger is Tucker’s. But be smart and make it a double. There’s a temptation to veer toward Portland, one of the best food towns in the country, and select anything from Bunk’s pork belly Cubano -- a pioneer in PDX’s movement of high-end chefs making gourmet takes on lowbrow food -- to cart-turned-sauce-empire Nong’s Khao Man Gai or a stupid maple bacon donut. But to the 95% of Oregon that doesn’t own a pair of skinny jeans, Oregon bounty’s about seafood and beef. The former’s at its best at Newport’s Local Ocean, where fresh fish is bought daily and takes on its best form in the rare, bacon-wrapped tuna mignon, which you can usually eat while sharing a beer with the dude who killed it. And because it’s light, you can always chase it with a bacon donut… if you’ve got an hour to wait back in Portland. With apologies to the cheesesteak, the fry-stuffed classic at Primanti’s in Pittsburgh, and pierogies in general, the best thing in this beautiful state filled with gloriously unhealthy eats is one of the most underrated. John’s itself is a legend, and few can withstand the mix of the salty pork, melted sharp provolone, and Popeye-caliber spinach that define Philly's other classic sandwich. Bonus: its cheesesteaks are damn good too. The act of actually grilling a pizza began in Providence over 30 years ago at Al Forno, and has since become the best kind of Rhode Island tradition (sorry Del’s frozen lemonade and johnnycakes). But no one does grilled ‘za with the same skill as the originators, and the best of those is the original margarita, with a three-cheese blend, San Marzano tomatoes, and those signature scallions adding a tang you never seem to get in normal margherita pizza world. South Carolina's a tough call. 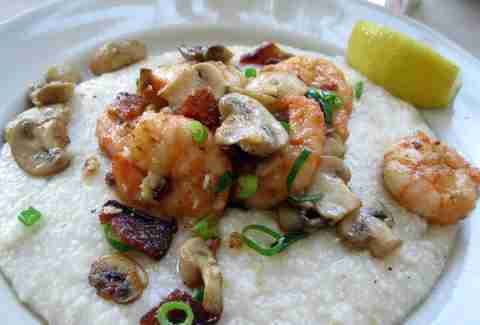 Its signature cuisine teeter-totters between soul food and barbecue depending on who you ask, but the best bite for us has got to be the shrimp & grits at Hominy Grill. You'll be elbow to elbow with South Carolinians devouring the Charleston Nasty chicken biscuit sandwich, but don't veer from the all-important Southern staple, shrimp & grits. Hominy takes its name from the type of corn used in said grits, which come from a local water-powered mill, then are perfectly cheesed up and studded with a crown of shrimp, crispy bacon, and umami-enhancing veggies (mushrooms, scallions) that make these the kind of true grits even John Wayne couldn't top. South Dakota’s claim to culinary fame is chislic, which is basically deep-fried beef cubes on a toothpick. Most people outside SoDak don’t know what the hell it is, mainly because it’s gross. The Stadium -- a trio of unassuming sports bars -- offers up a way better variation in the form of tenderloin tips that take a bath in a secret marinade before being getting breaded and fried to order (we recommend rare). For the more voracious, you can even get them served in a taco-salad shell, which you should, because none of the juice goes to waste. And lest you doubt the authenticity of these beauties, take heed: among the restaurants' most loyal clientele are cattle ranchers. They know a thing or two about beef. Look, we love Memphis BBQ as much as any self-respecting adult with denial about type-2 diabetes, but by that same logic, we can’t deny the power of red-hued fried chicken that might burn a hole in your esophagus. And the fact is, Prince’s serves the best damn spicy fried chicken in America. Yeah, there will be a line, but that just gives you time to prepare your heart for the heat. Order it “hot” and be prepared to sweat. And whatever you do, don’t rub your eyes while eating. No dish is more Texas than brisket, and no brisket exemplifies the great heights the meat can achieve quite like Franklin Barbecue. Sure, it'll cost you five hours of your life waiting in line, but those 300 minutes melt away as soon as you reach the meat carver and they slice off a fatty hunk of beef candy. The anticipation makes for an even more visceral experience. The pillow-soft fat and sinfully tender meat, wrapped in a blanket of smoke, create one of the most excellent bites of food you can find anywhere. What Utah may lack in alcohol-serving abilities, it makes up for in burger innovation. It's one of the only states where bacon's not the best meat-on-meat topping thanks to a few Greek immigrants who forever altered the local burger landscape back in 1978 by topping their patties with rich shavings of pastrami. Nearly every other local chain followed suit, but the original is still considered the best by most locals thanks to a charbroiled patty flamed to complement the smokiness of the pastrami. The intense meats are tempered by typical burger accessories (lettuce, onion, tomato), a slice of American cheese, and a slap of Thousand Island. Maple syrup and snow form 95% of all matter in The Green Mountain State, so it's wholly appropriate to make the spring pilgrimage to Morse Farm in Montpelier for some hot maple action. Heated maple syrup is drizzled over shaved ice and it makes for taffy-like sweetness that pairs perfectly with a fresh donut. In Virginia, ham is king. But don’t think that it’s just limited to your gramdma’s favorite Christmas fare. At Stove, it’s made by a dude who prefers the title of “cowboy” to “chef,” and he prefers his cured meat to be called by its real name: Smoochie Bear ham. 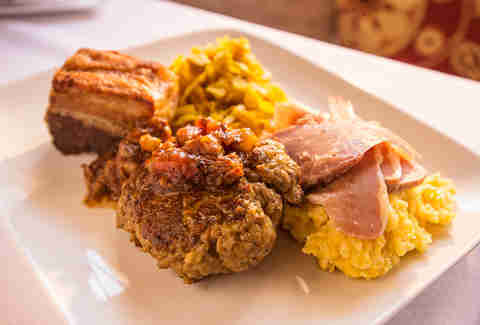 And while a big plate of Smoochie would be fine and dandy, he ups the ante with the Pork O Rama plate, which also includes slow-roasted pork belly, house-made sausage, and pork belly jam. Maybe this is what Jay-Z was talking about? You know all those dudes on Deadliest Catch? Most of 'em are from Seattle, and when they're not on TV chasing the less flavorful, and wayyy more scary looking Alaskan king crab, they're down here catching the key ingredient in Washington's greatest food achievement: the Dungeness crab cake. It'd be stupid to ruin the subtle, sweet flavor, and tender texture of Dungeness crab by frying it like they do with blue crabs in Maryland, so chefs here -- most notably Tom Douglas, who has a whole book about crab cakes -- pack it loosely with breadcrumbs and other stuff before lightly grilling it. The result is a crunchy treat that actually still tastes like crab and can be found at almost any restaurant in the Pacific Northwest, but you owe it to yourself to get your crab cakes at Douglas' Pike Place Market spot, Etta's. Or one of his other restaurants where they're on the menu. Ben's Chili Bowl gets most of DC's half-smoke hype (that'll happen when you're a longtime local institution and Obama shows up for a visit), but if you're judging on taste (and you should be! ), no one's doing this local sausage delicacy (think a big, smoked, spicy hot dog with a coarser ground) better than Meats & Foods, which makes its spicier-than-expected rendition daily in-house. Get it properly topped with its chili, a squirt of mustard, and some finely diced onion -- make sure you have a stack of napkins at the ready -- and go to town. Much like crushed red pepper and the Noid, pepperoni just doesn't get much respect outside of the world of pizza. But in West Virginia, the humble meat stars in a proto Hot Pocket originally created to light the dark lunch depths of coal mines. It's another case where the original set the bar and its simplicity has never been surpassed. For $6.50 you can score a dozen of the Country Club Bakery's yeasty white rolls stuffed with sticks of meat whose juicy oils permeate the bread when baked, resulting in a pepperoni-flavored starch bomb that much like a Bagel Bite, can be consumed in the morning, evening, or at suppertime. Frozen custard is as ingrained into Wisconsin culture as the Packers and PBR. Kopp's is the standard by which all other custards are measured, with flavors ranging from orange dream made with local Sprecher's soda to Snickers chunky cheesecake, though humble vanilla is the best around. Look, if you want a great steak in Wyoming, you can get one pretty much anywhere with swinging saloon doors. (Might we recommend the Virginian in Buffalo’s Occidental Hotel? Teddy Roosevelt sure did.) But what’s the point in being in a state where you can do whatever you want if you don’t eat a steak that’s skewered on a pitchfork, dumped into a vat of hot oil, and served sizzling in a cookout setting 8,000ft above sea level? That’s what you get at this seasonal spot, which takes what sounds like a punchline about Western living and transforms it into one of the most memorable meals you’ll ever have. It’s basically the cowboy equivalent of a Brazilian steakhouse, only you won’t be embarrassed when you try to speak Spanish to a person who only understands Portuguese. Dan Gentile is a staff writer on Thrillist's national food and drink team. 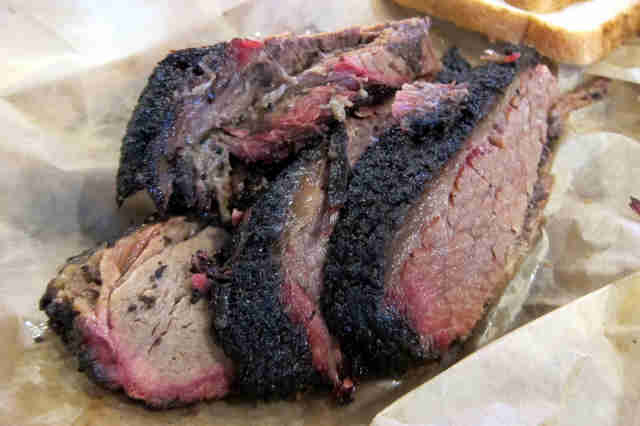 He is located in Austin, TX, four blocks from the line for Franklin Barbecue. Follow him to 300 minutes of anticipation at @Dannosphere. Thrillist senior editor Andy Kryza is currently very concerned about the threat of a bike-by shooting in his Oregon home. Follow him to food-cart banishment @apkryza.